Whether you’re hopping down the bunny trail or searching for eggs, we’ve got 10 easy ideas for creating memorable family traditions at your Easter party. What traditions come to mind when you think about Easter? Going to church? Chocolate bunnies? Easter baskets? Jelly beans? There are so many ways to celebrate and enjoy this special day. Today we’re sharing some of our family’s favorites. Every year, we spend Easter at my Aunt Ronda and Uncle Bob’s house with all of my aunts, uncles, cousins and their children. Aunt Ronda and Uncle Bob are wonderfully gracious hosts when you consider just how large my extended family is. My Dad is one of eight children. All but one of his eight siblings had 2-4 children each. Now those children are all grown up and many have 2-4 of their own kids too. Altogether there are well over 60 people for dinner on Easter at Aunt Ronda and Uncle Bob’s — and that’s just the half of us who can make it! 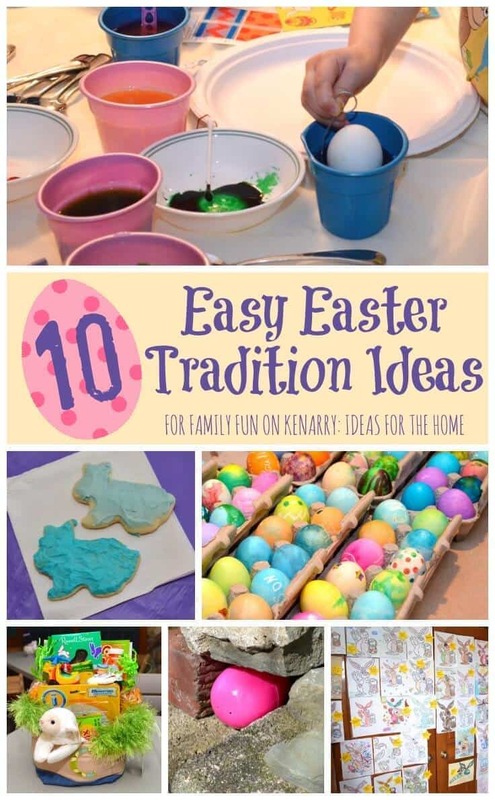 And yet, they invite us back year after year, continually carrying on the Easter party traditions I enjoyed when I was a child plus adding new ideas to make it a special and memorable weekend for all ages. Aunt Ronda and Uncle Bob’s Easter party is something I look forward to every year. While it’s wonderful to catch up with relatives I only get to see once a year, Aunt Ronda and Uncle Bob really go above and beyond to make the Easter party special with easy traditions anyone could implement. 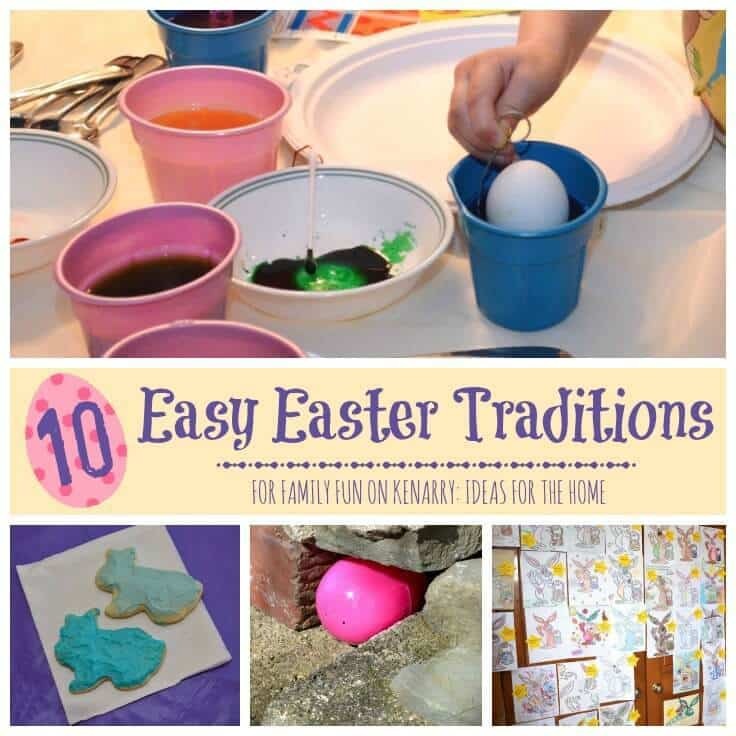 I wanted to share ten of the ideas with you today in the hope that some of our special traditions will inspire you to create some new Easter party traditions for your own family. I grew up with the Catholic tradition of fasting from meat on Fridays during the Lenten season. On Good Friday, Aunt Ronda and Uncle Bob host a dinner for anyone who’s made it into town for the weekend. Uncle Bob mans the fryer preparing fish that either he’s caught or that some of my uncles have brought to contribute. Each family brings a dish to pass so there’s plenty of food for everyone. It’s been years since my grandparents passed away, but Easter wouldn’t be Easter if Aunt Ronda and Uncle Bob didn’t make Grandma’s bunny sugar cookies. They still use the cookie cutter she used! While Grandma always frosted them with a white glaze, Uncle Bob and Aunt Ronda have moved to bright spring colored frosting. 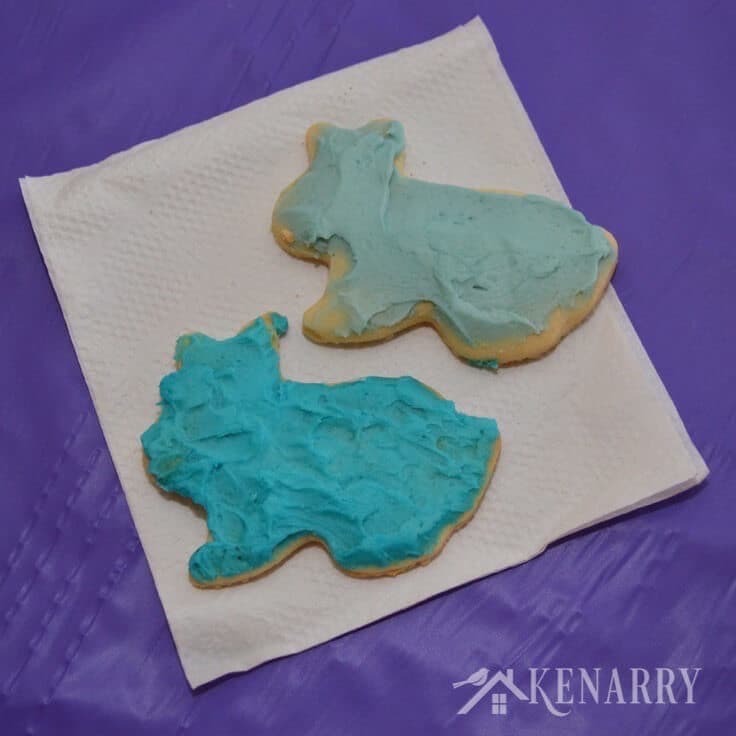 It doesn’t matter how many other goodies there are at the Fish Fry or Easter party, everyone looks for the bunny cookies first. On Saturday evening after dinner, Uncle Bob boils dozens and dozens of eggs for us to color. 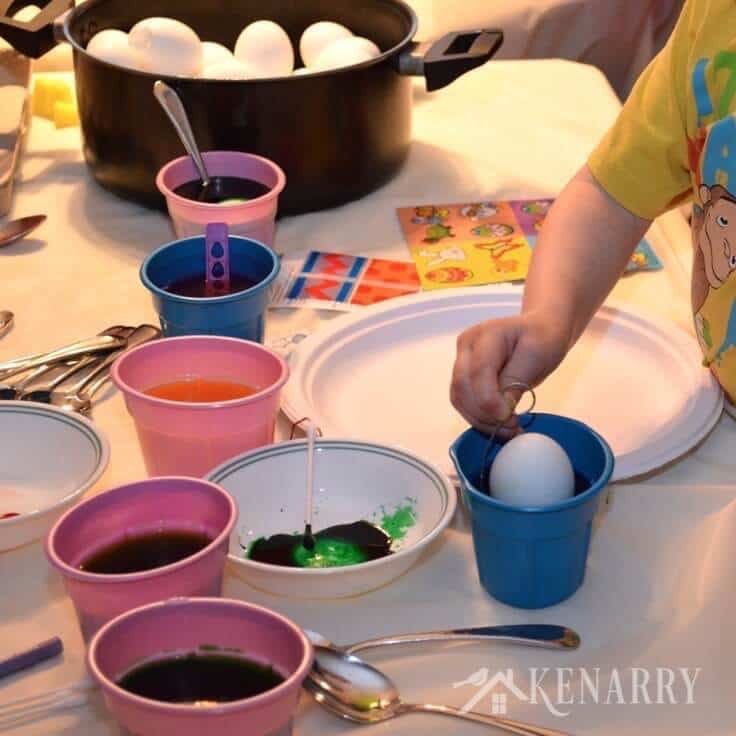 We’ve tried decorating eggs in many different ways, but lean towards dipping them in dyes and painting them with daubers. 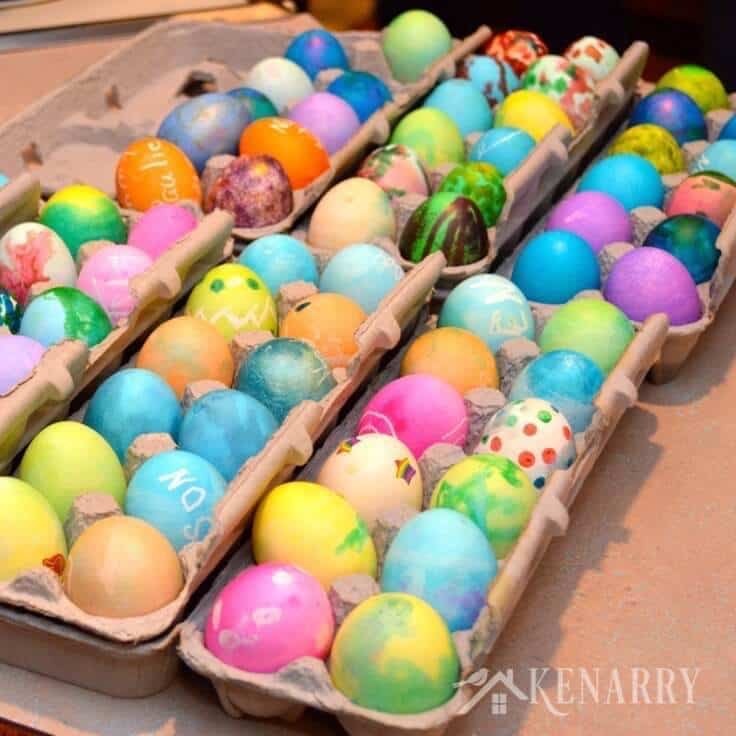 By the time we’re done, there are no white eggs left in the house and our fingers are colored for Easter morning. It’s usually my older brother’s job to turn all of these magnificently colored eggs into deviled eggs for dinner at the Easter party. When I was a child, we’d wake up on Easter morning to search for our Easter baskets. The older we got, the harder it was to find our Easter baskets. I think one year mine was actually wrapped in a garbage bag in the grass clipping bag on the lawn mower. We’ve carried on the same tradition with our children. They’re only little guys, though, so their baskets are much easier to find. A friend of mine created adorable cloth baskets for my boys with their first initial on them. I used fuzzy yarn to knit Easter grass that we could re-use from one year to the next. 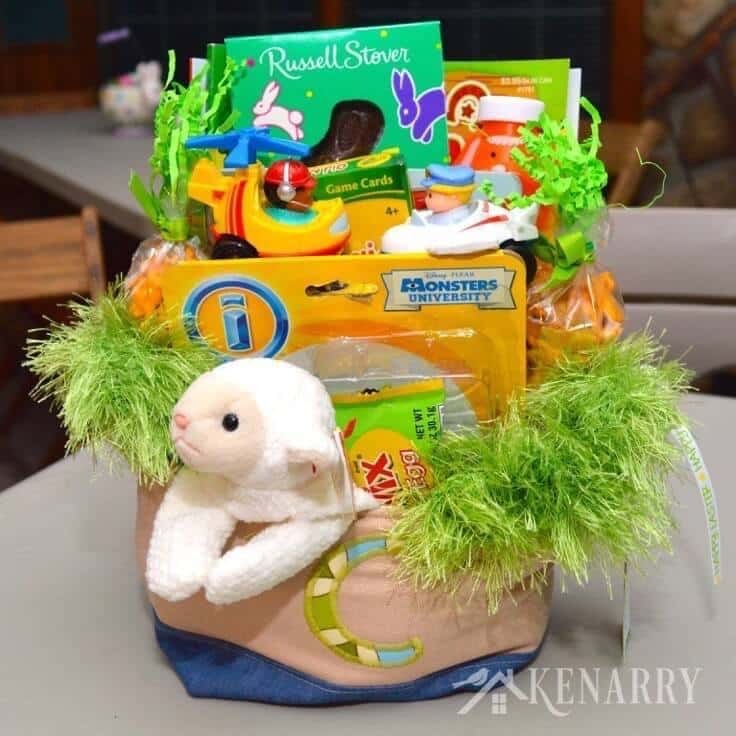 We fill the basket with chocolate bunnies, small toys, books and other trinkets. The last few years I’ve also made Cheddar Bunny Carrots to help cut down on the amount of candy in their Easter baskets. When I was a teenager, my parents created a family newsletter that they’d write every week. There was no e-mail back in those days, so they’d have to painstakingly print 9 copies on the dot-matrix printer, collate and mail the newsletters. As you can imagine, I was a regular contributor to the family gazette with a column called “Carrie’s Corner.” The rest of the extended family contributed periodically as there was news to share. 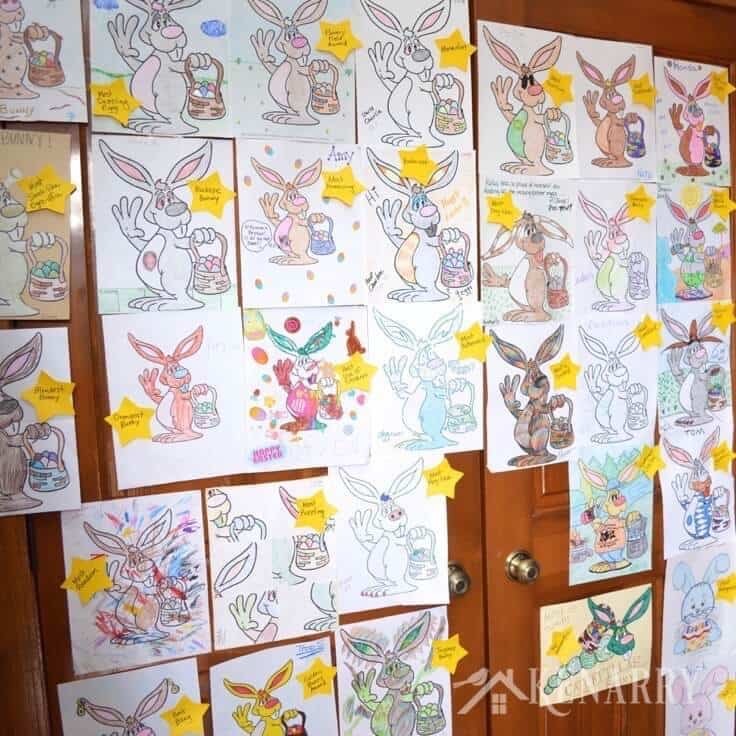 These days our communications have been replaced by the speed and reach of a large family Facebook group, but one thing remains as a legacy from those old gazette days – the annual Easter Coloring Contest! A few years ago, Aunt Ronda started breaking out the craft supplies mid-afternoon during the Easter party. 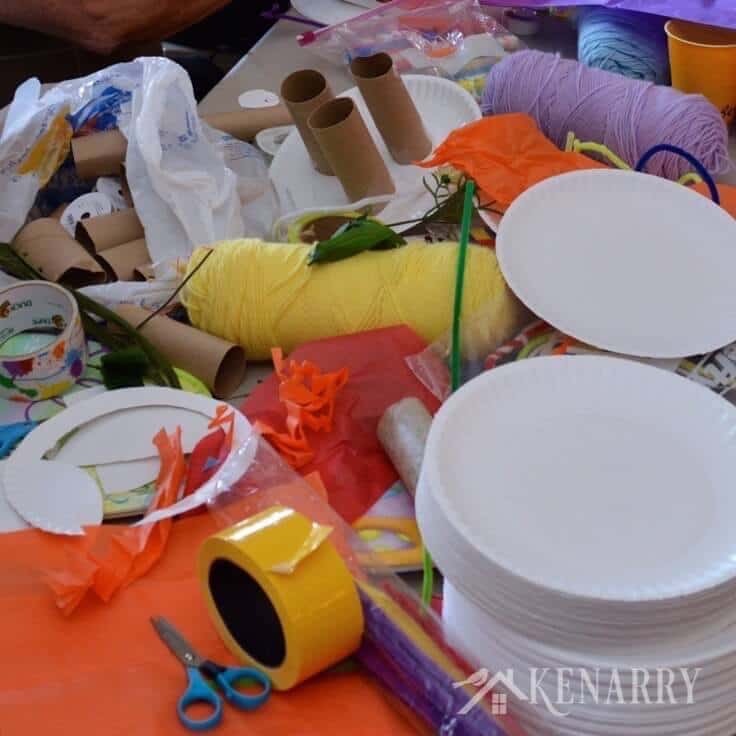 We all wondered what in the world she had in mind for paper plates, tissue paper, empty toilet paper rolls, pipe cleaners, scissors, tape, stickers, yarn, artificial flowers and more. Little did we know, she was starting a new tradition: Do-It-Yourself Easter Bonnets. Everyone makes their own hat fashioned out of whatever they can find in the stash of craft supplies at the Easter party. 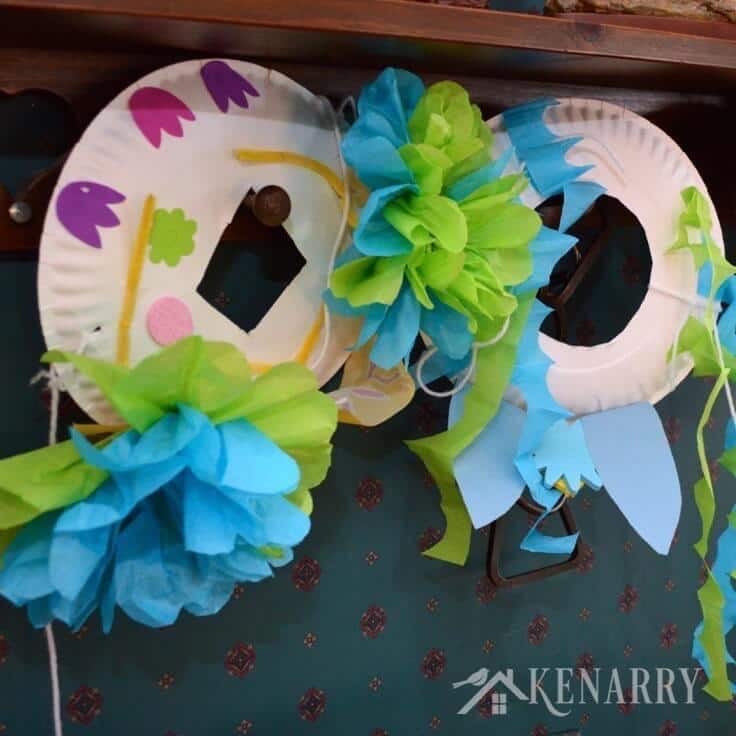 While most use a paper plate as the foundation for their Easter bonnet, some get creative with headbands, cones and any other ideas they can come up with. 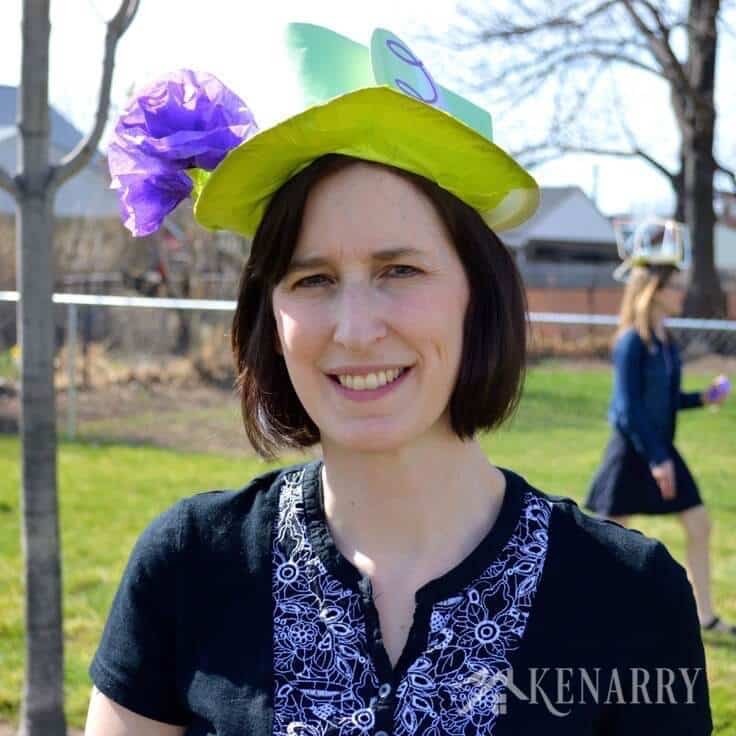 When you have 60+ people at your Easter party wearing festive bonnets, the natural thing to do is line up on the sidewalk in front of the house and parade down the street to the neighbors, right? Lucky for us, one of my Dad’s sisters lives just three doors down from Uncle Bob and Aunt Ronda so that’s the destination for our family parade. We are quite the sight! One year a neighbor even dressed up in a chicken suit just to join in the festivities. Many families have an Easter Egg Hunt at their annual Easter party, but ours has a special twist. 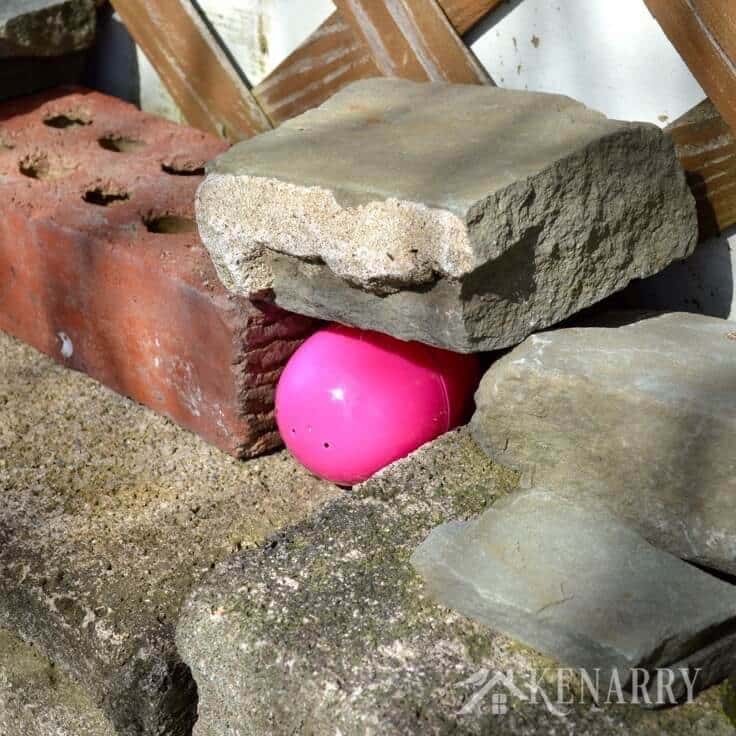 Instead of finding as many eggs as you possibly can in the shortest amount of time, each person has one specific egg with their name on it to find — and I mean each and EVERY person no matter how young or old they are. If the egg you find has someone else’s name on it, you just put it back where you found it and keep searching. Toward the end, you have adult cousins bribing each other with “I’ll tell you where your egg is, if you tell me where my egg is,” but it’s all in good fun. How can it not be when you have more than 60 people in crazy Easter bonnets wandering around the backyard?! 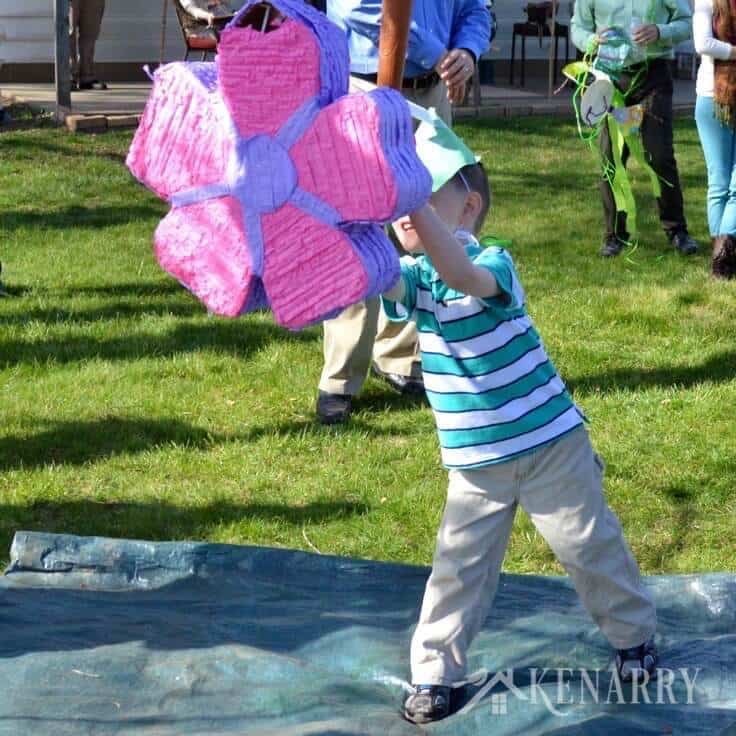 As if Easter bonnets and hunting for eggs wasn’t enough fun for one family, Aunt Ronda and Uncle Bob stepped it up a notch a few years ago when they added an Easter Party Piñata. Unlike the other family Easter party traditions, this one is just for the kids. They line up from shortest to tallest for a chance to swing a bat at a bright spring colored piñata filled with candy. The older ones are required to wear a blindfold to make it more challenging, but the younger ones like my boys just go for it! No Easter party would be complete without a big family dinner. Uncle Bob and Aunt Ronda actually feed us twice on Easter Sunday. The first meal is in the early afternoon after everyone arrives from their church services and morning Easter traditions. The second meal is in the evening after the bonnet making, parade, egg hunt and piñata bashing are finished. Both meals are potluck with every family bringing one or more dishes to share. A potluck is really the best way to feed a group this large. The Easter party menu always includes a large ham, turkey, scalloped potatoes, green beans, salads, a relish tray, deviled eggs, bunny cookies plus much, much more. Let’s just say if you go away hungry after this Easter party, it’s really your own fault! Personally, I love special traditions, quality family time and reasons to be together to celebrate. I’m thankful my aunt and uncle host this Easter party year-after-year so I can pass these fun Easter traditions along to my own sons. Just the other day, my four year old, C1, was looking over my shoulder as I was putting Easter dates on my calendar. He said to me: “Mommy, I wish Easter would come now.” Me: “Why?” C1: “Because I love hunting for eggs.” I’m glad I’m not the only one who looks forward to the annual Easter party! What are the ways you make Easter special for your family? Please comment below and share about your family’s Easter party traditions. 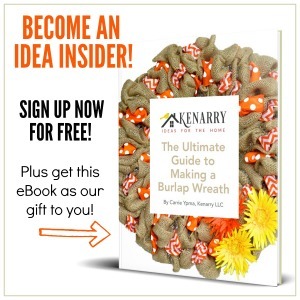 We’re always looking for new ideas and would love to hear about your annual festivities. Oh Marina, that’s one of the challenges of marriage, isn’t it? Combining the traditions you each had growing up into new family memories and traditions can be so difficult. Hope this post gave you a few ideas! A lovely post. Thank you for so many ideas to add to the fun and closeness of Easter! I’m so glad you enjoyed the post, Diane! Thanks for hosting the party and coming over to visit. These are all such great traditions! I can’t wait until I have kids to do some of these fun things with. Thanks for sharing with us over at Motivational Monday! Thanks, Melanie! So much to look forward to when you have kids someday! I’m glad you came by from Motivational Monday to check it out. These are great ideas! Easter is a fabulous excuse to celebrate with family, for sure! Thanks so much for taking the time to link up with us over at the #HomeMattersParty – we hope to see you again this Friday! Feel free to bring a friend! Kristen, thanks for hosting a wonderful party and swinging by to say hello. Enjoy your Easter celebrations with your family!